What’s the secret to superior photography? Well, I don’t have all the answers but I came across some tips that I put into practice…mostly…during my last full day of shooting and it seemed to work for me. At least, I feel better about the work I did. Here they are, nothing complex, just practical. When you think you see a picture, first ask yourself some questions? What type of light are you working with and what’s its source? Is the shot better horizontal or vertical? How do you want to compose? What kind of picture do you want? Then and only then ask yourself what camera settings do you need to make the image you have visualized in your mind? Shoot with manual settings. Remember, your camera is not making the picture, you are. Focus manually. Yes, focus manually. If you don’t know how, learn. Today’s cameras have all kinds of aids to make this possible and are getting better and better all the time. Whenever possible and appropriate, use a tripod. A digital camera can lull you to sleep. The fact is that once you have a camera it doesn’t cost you an additional penny to take two pictures, or 50 pictures, or a thousand. But what’s the point if you come home lacking a single image that somebody “wants to hang on their living room wall” in the familiar words of Robert McCurley. In case you have not guessed by now, every single one of the four tips above is going to slow you down dramatically. And you will find that, if you slow down, the number of shots you take will drop but the quality of your production will improve. I promise. Now to the picture above. 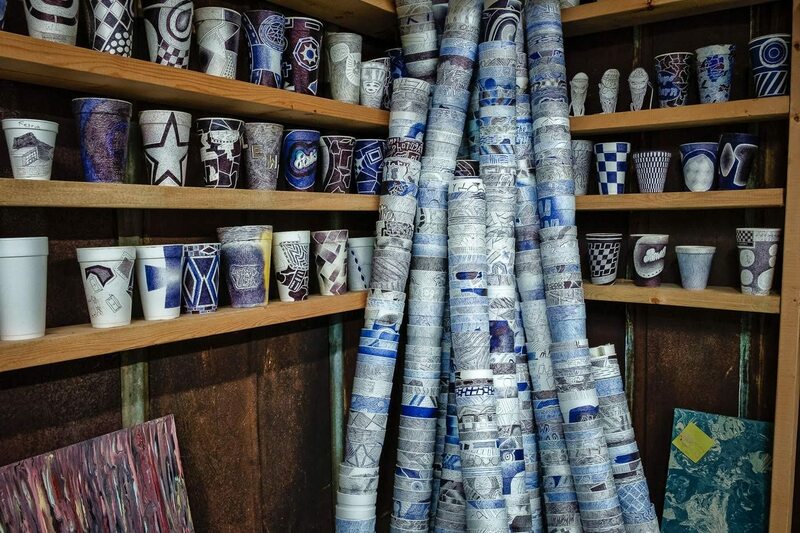 What you are looking at are just a few hundred of the thousands of Styrofoam coffee cups decorated by the owner (the “Mayor”) of Old Car City. Every business day he goes across the highway for coffee, brings his cup to his office and, when it’s empty, decorates it. Slowly. In some cases, beautifully, with no two exactly alike. They make an attractive display, don’t you think? And he has taken up to 14 hours to finish some of them…slowing down pays dividends in all artistic endeavors…including your photography. Do BPG Members Sometimes Have Too Much Fun? How Well Do You Really Know Your Camera? Appreciate your reminder. I’ve seen those cups and talked to the “Mayor,” but didn’t know the story. You are the best at getting the story!! And I do need to slow down! Thanks for the reminders and always love your stories!